The Funeral Game travels a pathway between two worlds, holding and reconciling Earth and Heaven - Life and Death as one reality. A soul landscape of changing myths, fugitive idols, where fantasy is at play and collection is coloured by a deep rooted spirituality and a longing for change in an ageing Christianity, much challenged by the secular. The Funeral Game is Monahan's way of reinventing himself and travelling on. "His poems have such vivacity that they carry us uncomplaining into the serio-comic world of e.e. cummings." "Monahan's poems take place in a sunlit imagination where the blacker side of life, although not absent, is not allowed to darken the material.... The mythological poems are light and magical: they dazzle the mind and have a comical touch." "What makes Noel Monahan's poems such a pleasure to read is the relish with which the poet approaches their composition." Noel Monahan has won several awards for his work. In 2001 he won the prestigious SeaCat National Poetry Award, organised by Poetry Ireland. Also in 2001 he won the RTE, P.J. O'Connor Award, for his play, Broken Cups. In 2002 he won the ASTI Achievements Award for his contribution to literature at home and abroad. Other awards include The Allingham Poetry Award and The Kilkenny Prize for Poetry. Noel Monahan's work has appeared in The Irish Times, The Sunday Tribune, Books Ireland, Poetry Australia, Paterson LIterary Review, USA and many more outlets. His collections of poetry include Opposite Walls (Salmon, 1991) and Snowfire (Salmon, 1995). He is co-editor of Windows Publications and has published five Authors & Artists Introduction Series. His plays include Half A Vegetable, a dramatic presentation of Patrick Kavanagh's poetry, A Proverbial Wet Summer, and Feathers of Time. His poetry has been translated into Italian, Romanian and French and he has read his work at numerous summer schools and poetry festivals throughout Ireland. His poetry has appeared in many anthologies, most recently texts for Junior Certificate and Leaving Certificate English. 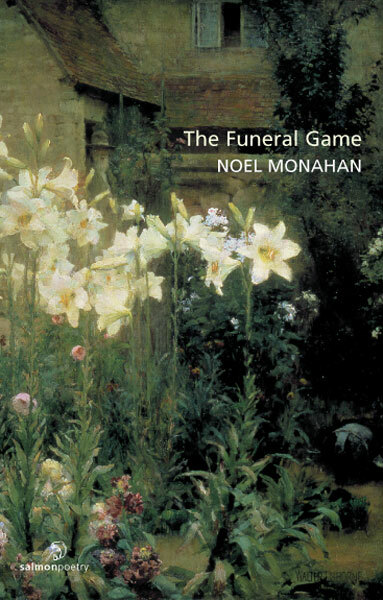 The Funeral Game is Noel Monahan's fourth collection of poetry. Opposite Walls was published in 1991, Snowfire in 1995, and Curse of The Birds in 2001, all published by Salmon Poetry. Discoveries and a Cavan Shaman. From the outset, Noel Monahan's work has seemed determinedly fleet of foot, suggestive rather than descriptive, and (call the poetry police!) optimistic. The title poem of the Cavan-born poet's fourth collection, 'The Funeral Game', neatly illustrates his ability to deal with darker subjects through lightness of touch. Here a group of childhood friends for whom "Every shoe-box was a coffin" imitates the adult ritual of death, holding wakes and even issuing 'death certificates/ To old crows, kittens, chickens..." The presense of so many poems which deal with animals ('Goat from Inchmore', 'The Black Pig' and 'Crane Dance' among them) indicates much more than a rural childhood familiarity and suggests instead a personal mythology, even a religion. In these largely spiritual poems, the presence of animals helps to earth a tendency to float. On occasion given to poems with "a message" (such as 'Threnody For Rosie', which interrogates the Celtic Tiger in just too general a way), Monahan is most successful with shorter, strangeness-risking poems and, given this fact, is particularly good on children or the world from a child's point of view ('Christmas Yawned in Waterlane'). Sometimes his tendency to celebrate seems to bring an unnecessary softening of an image, as when a vision of 'The Brown Hare' at the end of the poem of that name vanishes "into the cool of the moon" and you just wish he'd written the stronger and more chilling word "cold". Less formally assured than O'Donnell, Monahan still by times manages a terrific end-of-line double-take, as in his 'Morning Observations' where 'New clouds fall/ into action", and on its own his description of an accordion player "Folding and unfolding the grief of the sea" ('Accordion Player') should recommend his work to a wider readership. Mysterious and not always sure of itself, the best of his work has a hint of Native American animism about it - what I might call Cavan shamanism - and, given our blindness to our own natural world, is all the more welcome for that. © Copyright The Irish Times, 2004.